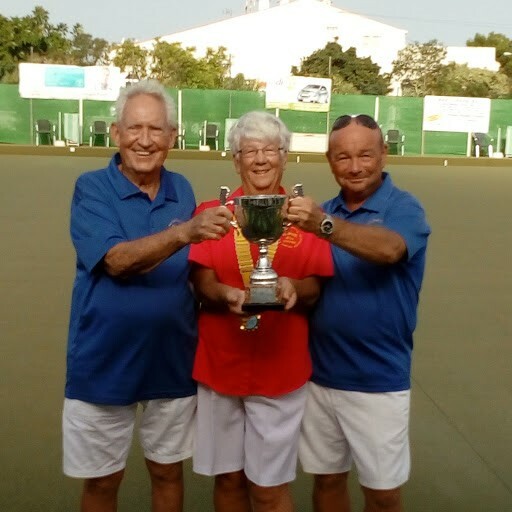 Home Sport Bowls San Luis Bowls Club Report 14.09.18. 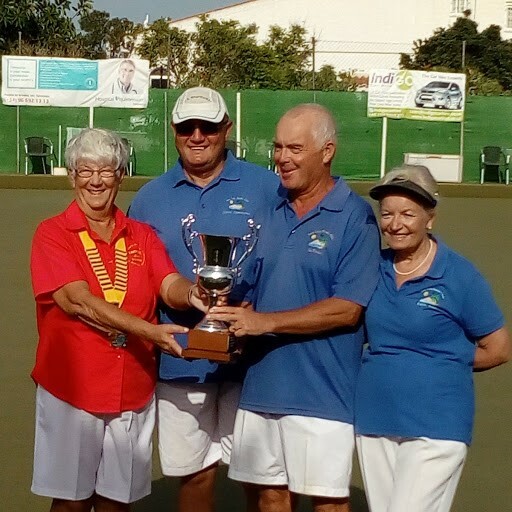 San Luis Bowls Club Report 14.09.18. The Semi Finals & Finals were played at San Luis BC from 8th-10th September and several of our members had battled through the rounds to reach the semi-finals. Well done to Men’s Singles: Ian Kenyon, Ladies Pairs: Jan Pocock & Suzi Cooper, Men’s Pairs: Allen Bowen & Scott Malden, Mixed Pairs: Kath Reid & Ian Kenyon, Mixed Triples: Steve Simmons, Kath Reid, Ian Kenyon. Unfortunately the weather caused havoc during the semi finals, which meant that the finals ran over Monday & into Tuesday, by which time we still had teams in the Men’s Pairs, Mixed Pairs & Mixed Triples. 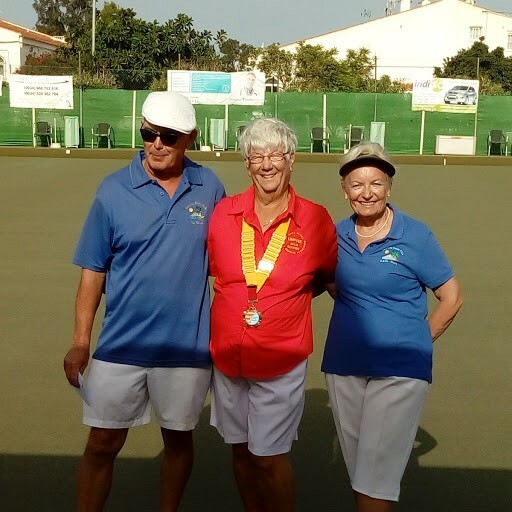 In the morning’s Mixed Pairs Kath Reid & Ian Kenyon fought hard but were overwhelmed by Sue Milner & Gary Raby (SM) who seemed to find the impossible lines and to thrive, in spite of the windy conditions, taking a convincing win. Our Men’s Pairs had a great match against Brian Harris & Richard Lee (ER). Considering Allen had undergone serious surgery just a few weeks ago he had an amazing game and Scott added his own perfect touches for a well earned win. In the afternoon Kath & Ian were joined by Steve Simmons in the mixed triples against a strong (EI) team of Ann-Marie Stevenson, Drew Gerrard & Colin Lindgren. It was a very one-sided match to begin with; gradually Colin`s team pulled well ahead. Then a few bad ends from EI, when they couldn’t get close, or Ian moved their closest bowl, allowed Ian’s team to pull back level and they finally went ahead on the 17th end. The 18th end was nerve racking for the players and spectators alike, the strong winds were still causing problems and the nerves were creeping in. Fortunately Ian kept calm and drew a close shot and although Colin tried to take it out, which could have meant an extra end, for once he missed and San Luis won by 1 shot!! Well done to all the finalists and winners; as spectators it was thoroughly entertaining, thanks also to Arthur & Barbara Brown for their organisation & everyone else involved. “Vic’s hamper” which is open to all, will run 10:00/10:30 on Saturday & Tuesday mornings through September. After a successful 2017/18 season, San Luis BC is entering 4 teams again in both Monday & Friday leagues for the 2018/19 winter season. We continue to welcome new members especially those who are newer to bowls and who want to try to start playing, or progress, in the leagues. For more information about San Luis BC or to talk about possibly joining, contact June Jones, Club Captain: 691903773.